Monday night, SF Tao of Pao, the ladies from Farm & a Frying Pan, and I gathered together for our third installment of our blogger dinner. The theme this evening was “Spring” and the F & FP gals imagined a beautiful menu, consisting of pea risotto, oven baked asparagus, and some iteration of berry cobbler. As the email exchanges flew and logistics were made, I found myself to be the last to respond and suddenly (cue dissonant chord) I was the one in charge of the desert. Dessert means baking. Baking means exact measurements and exact ingredients. And that means failure on my behalf. 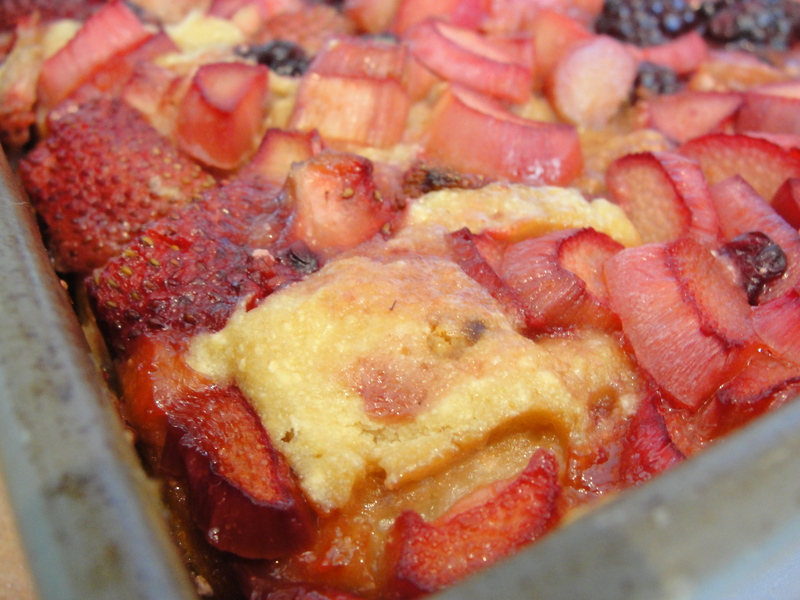 Although I had a brief moment of panic – baking is seriously my cooking kryptonite – I was excited to have the opportunity to cook with rhubarb, a tangy vegetable that has found its way into strawberry pies, jams, and the hearts of the American people. I didn’t know what I was getting myself into, but I decided, this time around, I would find a good recipe, follow it step by step, and create the perfect low sodium, berry, rhubarb pie. Something I could proudly share with others. Of course, this didn’t happen. Even with a gorgeous Saveur Rhubarb Cobbler recipe in hand, I somehow managed to take major detours and use much (unfounded) creative license. When I realized that I forget to buy milk, I decided that limeaid, pear preserve, and ricotta cheese would work as a good substitution. Right… And then, after promising myself to take my time and make exact measurements – carefully packing the brown sugar down and leveling the baking powder – a few flour spills later and I had thrown my measuring spoons into the sink and decided to do the rest by feel. This is like driving with your eyes closed. Not a good idea. But somehow, the cobbler turned out doughy, moist, and perfectly sweet. Definitely not a good lesson for me – I got away with baking murder – but now I’m determined to recreate this recipe so that I can pass it (confidently) on to others. In the meantime, here is the actual Saveur recipe (with a few low sodium alterations). Follow it, if you choose to do so. Or go commando, like me, and be prepared to pay the price. Or, on the off chance, reap the rewards. Just when you don’t expect it, you could have a moment of low sodium genius. 2. 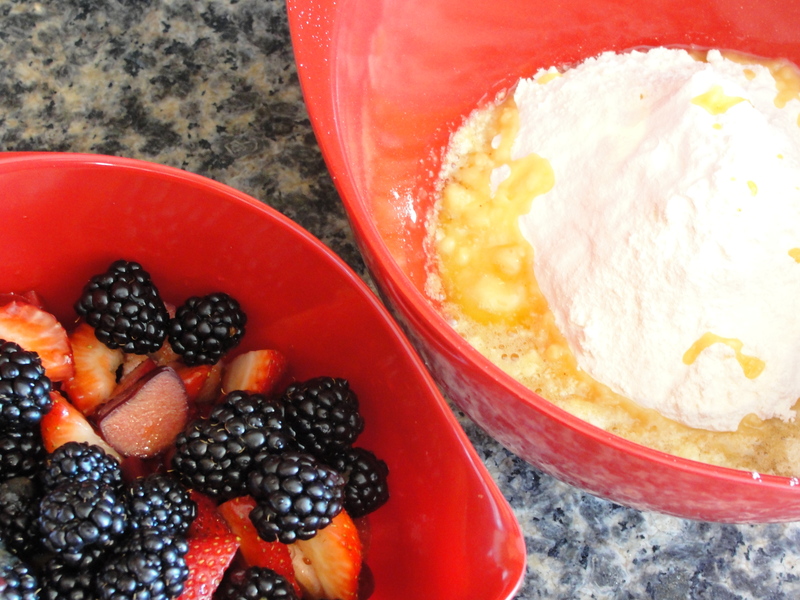 In a medium bowl, combine rhubarb, strawberries, blackberries, and brown sugar. Mix well and set aside. 3. 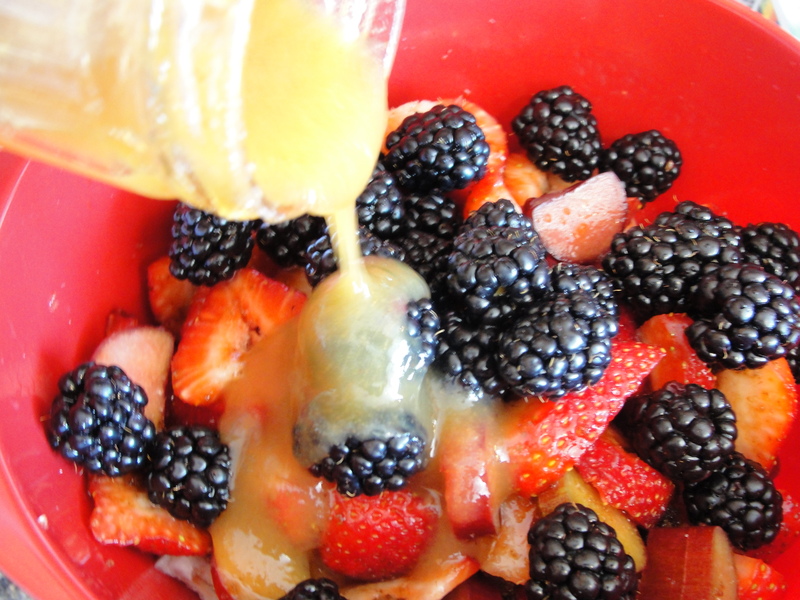 In a large bowl, combine 3 tbsp. of the melted unsalted butter, eggs, coconut milk, flour, baking powder, vanilla, and sugar. Beat with a heavy whisk until a smooth batter is formed. 4. Grease a 9″ × 11″ pan with nonstick spray. Pour in the batter. 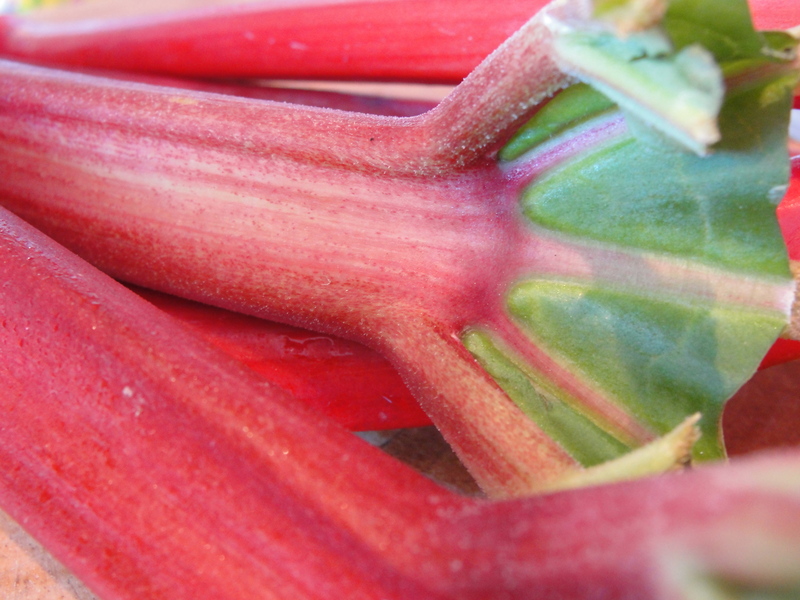 Spread rhubarb over batter and smooth it down so that the top is even. Drizzle with the remaining 1 tbsp. butter. 5. Bake for 40 minutes. The dough will magically rise to the top – so neat to watch. Serve warm with a scoop of low sodium, coconut vanilla ice cream. Loved reading about your cobbler! These are the types of desserts that benefit from commando-style baking. Cakes…candy…another story. But cobblers, bread puddings, etc…have fun…loved your substitutions. I’ve always ranked the bakers I’ve known by their creativity and willingness to throw out the rules and follow their bliss. I’m having a serious attack of the sweet tooth…your fault!